Ryburn Valley’s Dayle Maguire had the distinction of scoring the only goal in the Ziggy’s Metro Cars Halifax Sunday League at the weekend. Only one game took place as the snow fell and Valley beat King Cross 1-0 on Savile Park with Maguire making the all-important contribution. 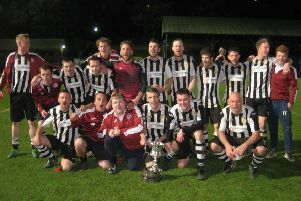 It was only Valley’s third league win of the season and lifted them a place to seventh in the Premier Division. In spite of the less than ideal conditions, the players were not holding back but referee Mick Denton earned praise for keeping a firm grip. Valley had the edge in the first half and although King Cross fought back in the second period they were unable to create much and Maguire took his chance well.